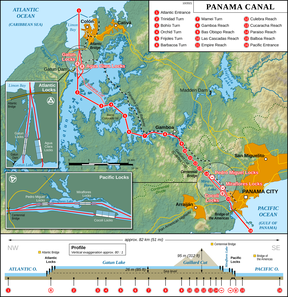 The Panama Canaul (Spaingie: Canal de Panamá) is a 77.1-kilometre (48 mi) ship canaul in Panama that connects the Atlantic Ocean (via the Caribbean Sea) tae the Paceefic Ocean. The canaul cuts athort the Isthmus o Panama an is a key conduit for internaitional maritime trade. Thare are locks at each end tae lift ships up tae Gatun Loch, an airtifeecial loch creatit tae reduce the amoont o excavation wirk required for the canaul, 26 metres (85 ft) abuin sea level. The current locks are 33.5 metres (110 ft) wide. A third, wider lane o locks is currently unner construction an is due tae open in 2016. This page wis last eeditit on 13 Mey 2018, at 22:28.